Squaw Valley Alpine Meadows hosted Team USA’s Winterfest event on Saturday, Jan. 13. The resort was part of a 13-stop tour for Team USA. 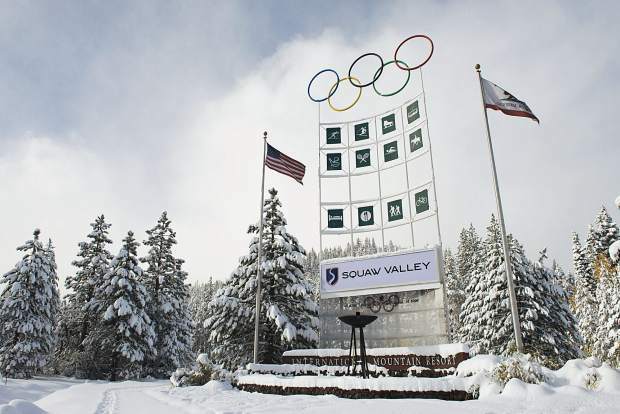 With the 2018 Winter Olympics just around the corner, the host site of the 1960 games — Squaw Valley Alpine Meadows — got into the Olympic spirit last weekend by hosting one of the stops for Team USA’s Winterfest. The 13-stop festival touched down at a packed Squaw Valley on Saturday, Jan. 13, with activities and events to build excitement for the upcoming Olympics and Paralympics. Guests took part in curling challenges, the Team USA’s Social Truck where they could create gifs of themselves, a s’more station, and more during the daylong celebration of the Olympic games. The highlight of the day’s festivities were guest appearances from local legends and four-time Olympians, Daron Rahlves and Marco Sullivan, who spoke to the crowds, signed autographs, and met with the next generation of skiers. Rahlves came up skiing in the area, and qualified for three Olympic teams (1998, 2002, 2006) for alpine, and then qualified for Team USA in 2010 as a freestyle skier. Sullivan qualified for the alpine squad in each Olympic year from 2002 – 2014, and was a four-time World Cup medalist. With several athletes recently qualifying for the Olympics and more set to qualify this weekend at the U.S. Snowboard & Freeski Grand Prix at Mammoth Mountain Ski Area, Sullivan reflected on what it was like to make an Olympic squad. “It’s an amazing feeling,” he told the crowd at Squaw on Saturday. “To be from a mountain town, the biggest thing I could for my country, I felt, was to represent them at the Olympics. And to do that, to accomplish that goal, it was great, it was kind of what I worked for ever since I was a little kid. The day’s festivities went into the evening with live music, drinks, and food at the Village at Squaw Valley. One of the biggest competitions of the season, the U.S. Snowboard & Freeski Grand Prix, will touch down at Mammoth Mountain Ski Area this week as athletes look to make one final push toward making the Olympic team. The competition serves as the final slopestyle and halfpipe qualifying events before the Feb. 9 start of the Olympics in Pyeongchang, South Korea. “Mammoth Mountain is proud and honored to continue the tradition of hosting the world’s best athletes in our Unbound Terrain Parks,” said Mark Brownlie, Chief Operating Officer, Mammoth Resorts in a statement from US Ski & Snowboard. Several riders and skiers from the Truckee-Tahoe area and Mammoth are expected to be competing, and vying for a spot on the Olympic team. The full start list will be released later in the week. Racing will begin at Unbound’s Main Park on Thursday, Jan. 18, with the men’s snowboard slopestyle qualifiers. Men’s and women’s snowboard halfpipe qualifiers will be the following day, with the men’s and women’s freeski halfpipe finals taking place that night on the park’s 22-foot halfpipe. Freeski and snowboard slopestyle finals will take place the following day with the snowboard halfpipe finals going off later that night, followed by the naming ceremony for qualified members of Team USA. Sunday’s racing will conclude with men’s freeski slopestyle finals. Contact staff writer Justin Scacco at 530-550-2643 or via email at jscacco@sierrasun.com.